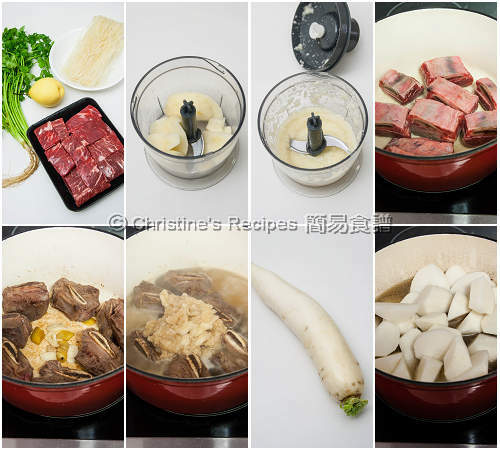 Whether it’s cold or hot, this Korean braised beef short ribs dish is so versatile to entertain your family’s taste buds. The cooking time looks a bit long, yet it’s downright easy. 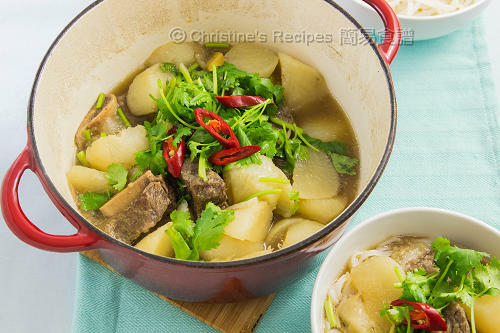 Once all the ingredients are ready and put them into a pot, you can sit back and relax. Or you might like to check it out once in a while to see how much water is left. Don’t let it dry up. That’s all you need to do. I pretty like their clever method of cooking meat in Korean cuisine. By browsing the recipe, you’ll know what’s the secret ingredient that takes the whole dish up a notch. Yes, that’s one pear. The beef ribs will take up its natural sweetness and turn softened more quickly. Beef and radish are good partners, blending their flavours so well. Our family enjoyed this one-pot dish so mush and didn’t want to miss every spoon of the soup. I blanched some rice noodles to go with it. It turned to be a tasty light meal for my family. Peel and core the pear. Roughly chop and process it in a food processor into puree. Generously season the beef short ribs with salt and pepper. Set aside. Heat oil in a heavy based pot over medium high heat. Place the beef ribs in one layer and cook until both sides are lightly brown. Discard excess oil. Push to the sides. Sauté ginger and garlic until fragrant. Pour in the water, pear. Increase heat to high. Cover and bring to boil. Reduce heat to simmer until the ribs are softened enough, about 40 minutes. The meat should be easily popped in with a chopstick at this stage. While cooking the ribs, peel the radish and roughly cut into chunks. When the beef is softened, add the radish. Continue to cook until the radish turns tender about 20 minutes. Stir in the seasonings. Add red chilli and coriander on top. 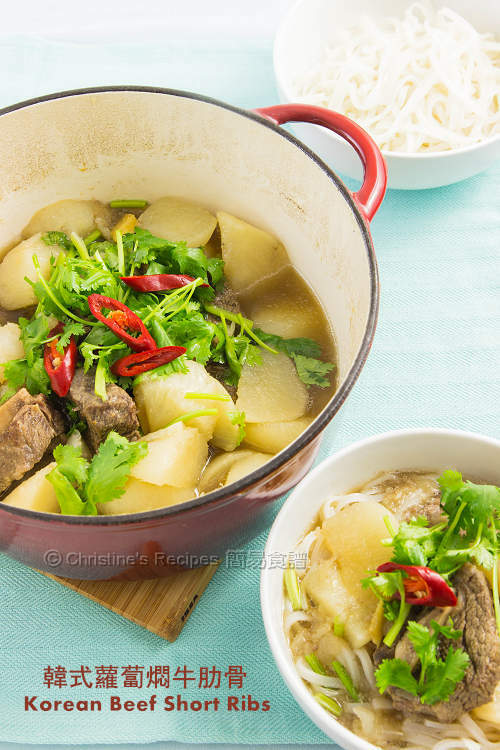 Serve hot, with cooked rice noodles if you like. The cooking time of beef ribs depends on their size. The amount of water used depends on the power of your stove and the material of your pot. If the water dries up too quickly but the beef ribs are not tender enough, you might replenish some boiling water and continue to cook. Can an apple be substituted for the pear? The traditional way of Korean cooking is to use pears. I haven't experimented with apple instead, yet I think it'd also speed up the cooking of beef ribs as many fruits can help tenderize meats. By using an apple, the taste of the end results might be slightly different from my version. Well, it's no harm to run an experiment if you like. What type of pear should I use, the yellow skinned one (round) or the green (bottle-shaped) one? Are you talking about Nashi Pears for round ones and Williams pears for bottle shaped ones? Either types will work. Often times Nashi pears are quite pricey. I'd often go for those sold at bargain price. A side note, the sugar of every type of pears is quite different. If you like this dish to a sweeter side, you might like to choose Williams pears or bosc pears. This is so appetizing and warming, Christine. And you made it seem simple to prepare too. Thanks, Angie. It's really simple and easy to make. It's so colorful and looks like a fat -free dish and that's suitable after Christmas! Thank you Christine, my ribs turn out to be delicious. It's so easy and there are not too many ingredients too. My ribs took longer to soften as I had doubled your portion. can we use pork instead of beef ? Haven't tried this recipe with pork. But I think it works too. This week I bought a massive radish and I needed recipes to use it up so I made this tonight and WOW it was delicious! I was doubting my soup but that last touch of soy... wow! I did, however, add not only a pear but also a small piece of rock sugar in a bid to speed up the softening of the meat. I think I cut my pieces up a little too big so it took a long time to soften. Even at the end it was just that little bit tough. 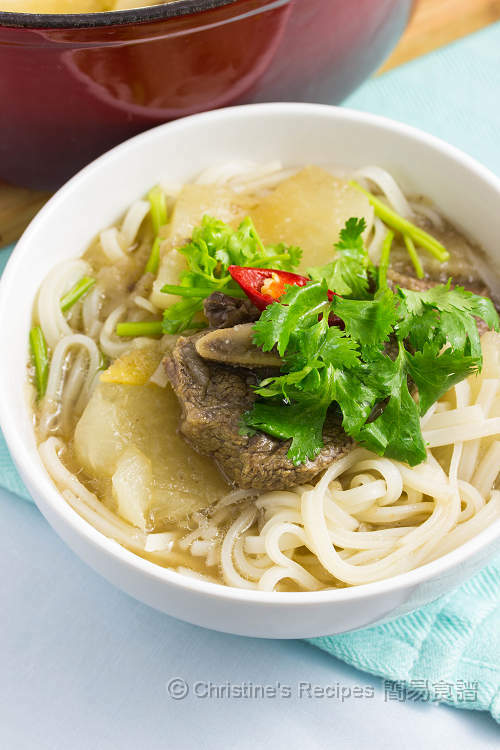 I do like the soup very much and we did serve it up with rice noodle. Do you think it'll be okay to top up with more water to yield more soup? Or would this compromise the flavour? Very glad that you liked this recipe. This recipe is quite forgiving. You can top up with a bit of water if you want more soup. If you add too many water, the flavour of the soup will be diluted. You might add some beef/chicken stock instead. Then flavour can still be there. Can i use pork ribs instead of beef? Yes, you can use pork ribs if you like, Juz.